Lucy is proof that sometimes a film doesn't necessarily have to make a whole lot of sense in order to be enjoyed. Luc Besson's latest is incredibly unrealistic and borders on ridiculous, but due to it's strong and intriguing female lead played by Scarlett Johnasson, it is forgiven. Johansson's title character provides intrigue and action which makes the film high paced and unpredictable. However, even Johansson's wonderful performance cannot take away from the fact that when you sit back and assess the story and screenplay, there are holes right through this film and a great deal of impossibilities. Yet, it may just be better to leave these thoughts be and just enjoy the fun that Lucy is. When American living in Taiwan, Lucy (Scarlett Johansson) gets mixed up in her boyfriend's suspicious mission to deliver a mysterious briefcase to businessman, Mr Jang (Min-sik Choi). After being knocked unconscious, she wakes up with bandage across her abdomen and is informed that she has a bag of the new "it" drug called CPH4 in her stomach which Jang and his men wish for her to smuggle into the United States for them. Before she is sent back home, she is attacked by a group of men who kick her in the stomach, breaking the bag of CPH4 which flows through her bloodstream and gives her the power to open her mind to it's full capacity. Lucy escapes and with the notion that she will not last long, tries to find Professor Norman (Morgan Freeman) who she believes will benefit from the research he will be able to complete on her state of mind. 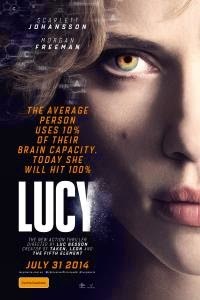 Lucy is an interesting combination of an insight into human existence film and action film. The basis for the film, which is that of the opening of Lucy's mind for her to use it's full capacity, is an original and very interesting one. How this links into the idea of what humans have done over time with this capacity and what we are supposed to do with it is represented well throughout the film. 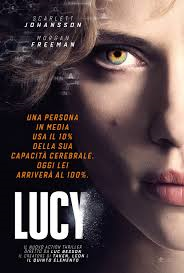 It is an enjoyable time coming to understand more about the way the human brain works through Lucy and Professor Norman's research, yet it doesn't take science degree to recognise where fact becomes fiction in order to make an entertaining action film. The principle which the film is based on which is that the average human brain uses 10% of it's capacity is actually more of a myth than anything else. The brain everyday uses a great deal more than this 10% and it's use depends on the activity or thought at hand. The idea of a human coming to resemble a superhero of sorts with mind control as their brain capacity rises in the way in which Lucy does is almost comical and does give the audience a few giggles. While the screenplay is quite clever with great character development and clever dialogue, there are also quite a few holes there. Lucy clearly has no adaption period or stops to wonder how she came to be able to feel more once the bag bursts inside her. Of course her brain capacity has just increased so perhaps she is supposed to somehow automatically know what she is capable of, but still doesn't seem likely given the situation. Another piece of the screenplay which doesn't make sense is when Lucy walks into the hospital in Taiwan and into an operating theatre where the surgeon speaks perfect English and addresses her as soon as she steps in in English, and not his native tongue. He automatically correctly assumes Lucy speaks English and not another language. Other inconsistencies exist during the film, but choosing the look over them allows the viewer to be able to enjoy the film for it's entertaining and enjoyable qualities, rather than it's inaccuracies. The high paced action scenes are extremely entertaining and well shot. Lucy really is quite suspenseful and quite unpredictable. The car chases are particularly entertaining through the streets of Paris as they are accompanied by colourful images of the strands of thoughts which Lucy can see going through people's minds. The cinematographic choices are interesting, particularly those of the shots of animals in the wild presented throughout the film to support what is being discussed in the film at that point in time. These pieces of nature photography make the film unique and remind the audience that this is not just an action film, but a film also about human existence. Scarlett Johansson is wonderful as Lucy. She has a great deal of character development and there is a distinctive difference between Lucy before she is exposed to CPH4 and after she is. Through the film, you see the person she used to be fading away as her brain capacity gets higher and eliminates her human features such as feeling emotion. When we meet Lucy, it is understood that she is an American student in Taiwan who is looking for a good time with her friends and boyfriend. She is absolutely hysterical when she is put in danger's way, but as the film goes on she gets calmer and calmer as her human emotions fade away. Johansson is wonderful when she is overly emotional at the beginning of the film and when she is just a body who is processing information at a rapid pace later on in the film. Lucy is highly entertaining, but gives you the impression that you cannot completely rely on all the information regarding brain capacity and human capabilities which it is trying to feed you. Taken for what it is, Scarlett Johansson once again proves that she is a brilliant action woman.